Interpreting this in the complex plane tells us that sinusoidal motion is the projection of circular motion onto any straight line. Thus, the sinusoidal motion is the projection of the circular motion onto the (real-part) axis, while is the projection of onto the (imaginary-part) axis. 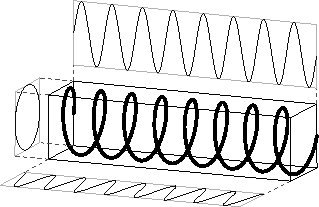 Figure 5.7:A complex sinusoid and its projections. Note that the left projection (onto the plane) is a circle, the lower projection (real-part vs. time) is a cosine, and the upper projection (imaginary-part vs. time) is a sine. A point traversing the plot projects to uniform circular motion in the plane, and sinusoidal motion on the two other planes.